March 2, 2019 9 a.m. – 4 p.m. In this hands-on workshop, participants will stretch their imagination to create expressive sculptures and figurative vessels depicting realistic or whimsical people and animals. Jane will discuss basic anatomy and proportions and will demonstrate slab building and modeling sculpture techniques. Tools to bring: Basic pottery tools plus small wood modeling tools about 1/4” wide, rolling pin, serrated flexible metal rib, small knife, fork, small acrylic paint brush for smoothing, images as references if desired. Marjons has a well equipped classroom with banding wheels, water buckets, extruders and slab roller. There will be a lunch break so bring snacks and beverages. Where: Marjon Ceramics, 3434 W Earll, Phx. 85017. April 14, 15 and 22, 2016, 9:00 a.m. – 4:00 p.m.
During the first two days of the workshop, students will work in water-based clay using the repousse technique of working with clay slabs to create wall masks and small-scale torsos. Repousse, a term originating from a traditional metal working, technique is a process in which volume and structure are developed by pressing out forms from the back side of the slab. The clay comes to life, acting like skin as it stretches over one’s fingers. Students will be encouraged to work loosely, responding expressively and intuitively to the clay. The pieces will be bisque fired for the following Friday when students will apply translucent underglazes as washes and stains similar to watercolor painting. Jane will show examples and discuss a variety of fired surface decorating techniques. The pieces will receive their final firing and be ready for pick-up after the workshop. During the first two days of the workshop, students will work in water-based clay using the repoussé technique of working with clay slabs to create wall masks and small-scale torsos. Repoussé, a term originating from a traditional metalworking, technique is a process in which volume and structure are developed by pressing out forms from the backside of the slab. The clay comes to life, acting like skin as it stretches over one’s fingers. 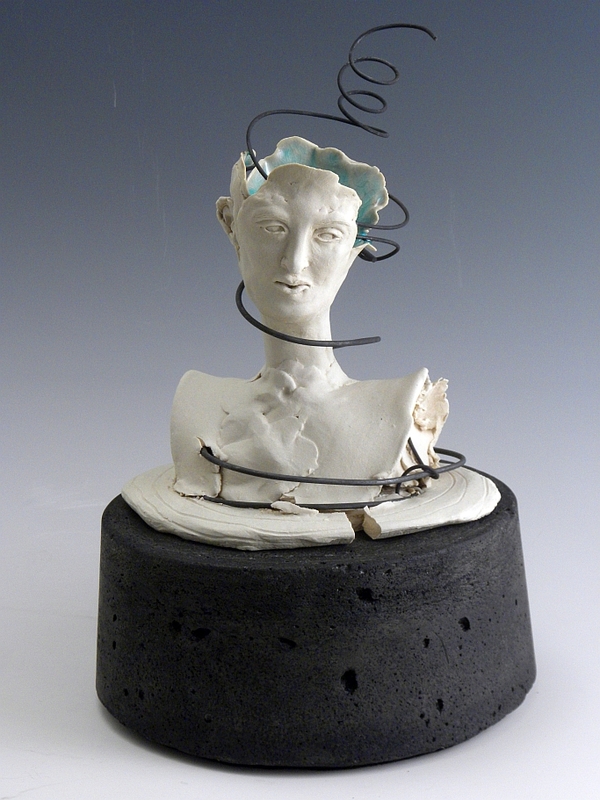 Students will be encouraged to work loosely, responding expressively and intuitively to the clay. The pieces will be bisque fired for the following Friday when students will apply translucent underglazes as washes and stains similar to watercolor painting. Jane will show examples and discuss a variety of fired surface decorating techniques. The pieces will receive their final firing and be ready for pick-up after the workshop.